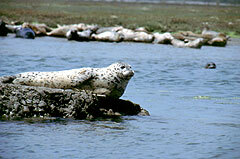 The harbor seal is probably the most widely known seal and is also referred to as the common seal. When hauled out on rocks or ledges, they often assume an arched position with their head raised and their hind flippers elevated, giving them the nickname “banana seal.” These seals are widely distributed in the North Atlantic and North Pacific regions. 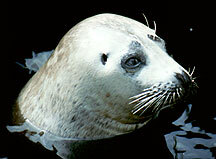 Harbor seals are rather small seals with a big head, short body, and short limbs. Adults, on average, weigh 90-140 kg (190-309 lb) for males and 65-80 kg (143-176 lb) for females, though pregnant females may weigh up to 140 kg (309 lb). The average length for an adult harbor seal is 1.5-1.8 m (approximately 5-6 ft). Harbor seals come in two basic color patterns. Some are white or light gray to silver with dark spots, while others are black or dark gray to brown with white rings.Harbor seals were thought to be the least vocal of the pinnipeds. Recent studies have shown, however, that males produce underwater vocalizations during the mating season to attract females or to compete with other males. Males establish territories in the waters offshore of haul-out sites. Using underwater vocalizations, they defend their territories against other males and display to females traveling through the area. Their underwater vocalization is described as a roar with a peak frequency at approximately 1.2 kHz. Harbor seals also produce a wide variety of in-air vocalizations, including short barks, tonal honks, grunts, growls, roars, moans, and pup contact calls.